This example shows how to use simulated annealing to minimize a function using a custom data type. Here simulated annealing is customized to solve the multiprocessor scheduling problem. The multiprocessor scheduling problem consists of finding an optimal distribution of tasks on a set of processors. The number of processors and number of tasks are given. Time taken to complete a task by a processor is also provided as data. Each processor runs independently, but each can only run one job at a time. We call an assignment of all jobs to available processors a "schedule". The goal of the problem is to determine the shortest schedule for the given set of tasks. First we determine how to express this problem in terms of a custom data type optimization problem that simulannealbnd function can solve. We come up with the following scheme: first, let each task be represented by an integer between 1 and the total number of tasks. Similarly, each processor is represented by an integer between 1 and the number of processors. Now we can store the amount of time a given job will take on a given processor in a matrix called "lengths". The amount of time "t" that the processor "i" takes to complete the task "j" will be stored in lengths(i,j). We can represent a schedule in a similar manner. In a given schedule, the rows (integer between 1 to number of processors) will represent the processors and the columns (integer between 1 to number of tasks) will represent the tasks. For example, the schedule [1 2 3;4 5 0;6 0 0] would be tasks 1, 2, and 3 performed on processor 1, tasks 4 and 5 performed on processor 2, and task 6 performed on processor 3. Here we define our number of tasks, number of processors, and lengths array. The different coefficients for the various rows represent the fact that different processors work with different speeds. We also define a "sampleSchedule" which will be our starting point input to simulannealbnd. By default, the simulated annealing algorithm solves optimization problems assuming that the decision variables are double data types. Therefore, the annealing function for generating subsequent points assumes that the current point is a vector of type double. However, if the DataType option is set to 'custom' the simulated annealing solver can also work on optimization problems involving arbitrary data types. You can use any valid MATLAB® data structure you like as decision variable. For example, if we want simulannealbnd to use "sampleSchedule" as decision variable, a custom data type can be specified using a matrix of integers. In addition to setting the DataType option to 'custom' we also need to provide a custom annealing function via the AnnealingFcn option that can generate new points. This section shows how to create and use the required custom annealing function. A trial point for the multiprocessor scheduling problem is a matrix of processor (rows) and tasks (columns) as discussed before. The custom annealing function for the multiprocessor scheduling problem will take a job schedule as input. The annealing function will then modify this schedule and return a new schedule that has been changed by an amount proportional to the temperature (as is customary with simulated annealing). Here we display our custom annealing function. % MULPROCPERMUTE Moves one random task to a different processor. % Copyright 2006 The MathWorks, Inc.
% on until it has generated enough neighbors. % is to ensure that the format of the schedule remains the same. % If the IRANGE is specified as a scalar. range = [0, 0];    % Special case of zero range. % Make sure RANGE is ordered properly. % Calculate the range the distance for the random number generator. % Generate the random numbers. % Offset the numbers to the specified value. %MULPROCFITNESS determines the "fitness" of the given schedule. %  knowledge given by "lengths"
%   Copyright 2006 The MathWorks, Inc.
simulannealbnd will call our objective function with just one argument x, but our fitness function has two arguments: x and "lengths". We can use an anonymous function to capture the values of the additional argument, the lengths matrix. We create a function handle 'ObjectiveFcn' to an anonymous function that takes one input x, but calls 'mulprocfitness' with x and "lengths". The variable "lengths" has a value when the function handle 'FitnessFcn' is created so these values are captured by the anonymous function. 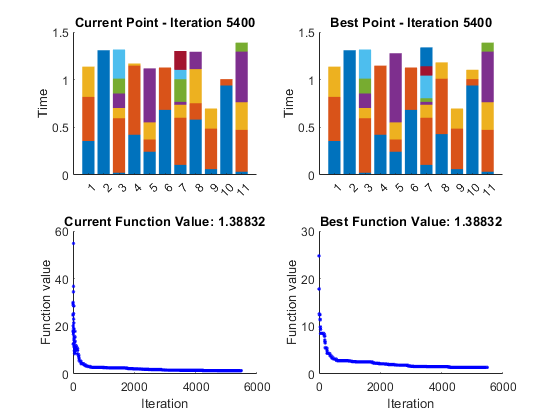 We can add a custom plot function to plot the length of time that the tasks are taking on each processor. Each bar represents a processor, and the different colored chunks of each bar are the different tasks. %   STOP: A boolean to stop the algorithm. %   Copyright 2006-2015 The MathWorks, Inc. But remember, in simulated annealing the current schedule is not necessarily the best schedule found so far. We create a second custom plot function that will display to us the best schedule that has been discovered so far. We choose the custom annealing and plot functions that we have created, as well as change some of the default options. ReannealInterval is set to 800 because lower values for ReannealInterval seem to raise the temperature when the solver was beginning to make a lot of local progress. We also decrease the StallIterLimit to 800 because the default value makes the solver too slow. Finally, we must set the DataType to 'custom'. Finally, we call simulated annealing with our problem information.